For nine years, from the age of three, Cayman had grown up to become more than Liz’s friend; he was her rock. A beautiful, dappled grey horse, kind and gentle, with a sense of humour. Now he was gone. The sledgehammer of shock felled Liz when she arrived home; two idyllic weeks in Cuba eradicated as if they had never happened. As her soul writhed, Liz was sure that she and Cayman had not left each other – and that they never would. Through a remarkable sequence of events, which unfolded with its own unstoppable momentum, Cayman taught Liz a crystal clear lesson. That lesson was about love – and its immense power. “Don’t go to see him until he’s lost his winter coat”, was what Sharon had told me in February. “He’s not so young and he doesn’t keep his winter rugs on, he’ll look rough now.” I could not wait to see Falconwood – ‘Woody’ as Sharon called him – but I made myself wait until he would have lost his winter coat. I knew that even Thoroughbreds can look like shaggy bears in winter, if they live out. Anyway, I thought, if I am going looking for a foal, there will be no point in going too early in the year. Sharon gave me the telephone number of Falconwood’s keeper, Mr Jones. In late May I rang to ask whether I could visit Woody. As there was no one in, I left a message. After a few days and, as I had not heard from Mr Jones, I rang again. The phone was answered. Mr Jones was “up the field, or in the shed.” I was talking to his son. No matter, I could ask him whether there were any foals; he would know. This was Falconwood! “Even if, when we get there, we see a black foal with a white star, do not react. Just act normally, no spooky business!” I was afraid that if Mr Jones learned of my quest for the predicted black foal with a white star – and had him – then either he would be unwilling to sell any foal of his to a lunatic, or the price may go so sky-high that, having found him, I could not afford to buy the foal. 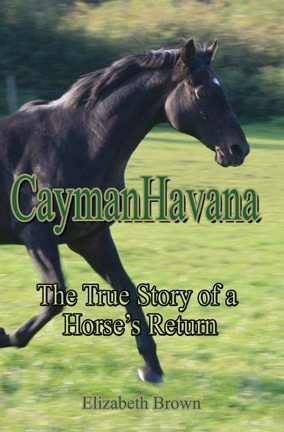 I tortured myself with worry and hoped that my stern briefing would safeguard my bargaining position, as simply a bereft owner making a 200mile round-trip to see Cayman’s father – which, to a north Wales horse breeder, was probably lunacy enough anyway. “He’s in the shed.” As I walked towards the shed, a polar bear came round the back of the enormous horse wagon which was parked in the yard. Terry was tall and robust, with thick white curly hair and white stubble. He had a calm and accepting air about him. We were welcomed and shown into the kitchen for tea; there was plenty of room for us all around the big table. “He’s a nice horse!” An opinion worth having. The first field that we went into was at the back of the farm, a big steeply-banked pasture of mares, yearlings and one very young foal – not black. There were two big horses, about 17hh, one chestnut, one black. “Those are half-brother and half-sister to your Cayman,” Terry explained. I was amazed. These were the first relatives of Cayman’s whom I had ever seen. I hugged the huge, black half-shire gelding – he had Cayman’s peacefulness. I could tell that he was used to being hugged. In response to Mr and Mrs B.’s and Lisa’s questions, it was interesting to hear from Terry about his horses, but I asked few questions and did not take any photographs. Where was Falconwood? I was on tenterhooks. Was I just about to see the little black foal with a white star? Was Kia’s prediction about to come cascading to fruition, engulfing me? Would I have Cayman back in the next moment? It was hard to ‘act normally’. Terry led us down the steep narrow lane. I had workedout that, as with anyone who has something impressive to show, he was saving the best until last. It was a lovely afternoon; we turned down another lane – where there were still late bluebells in the hedge-bottom and the hawthorn was in blossom – and stopped at a five-barred gate into an idyllic, banked meadow of lush grass, liberally sprinkled with buttercups and daisies. We could see the first field in the distance and Terry’s white farmhouse, with its grey roof. There were no horses in the field. Terry whistled. It was like a film … a magnificent dark horse, lithe and fit, with a fast, active pace, trotted up the steep bank from the bottom of the field. He had a striking, broad white star on his forehead, which I recognized – I was spellbound. 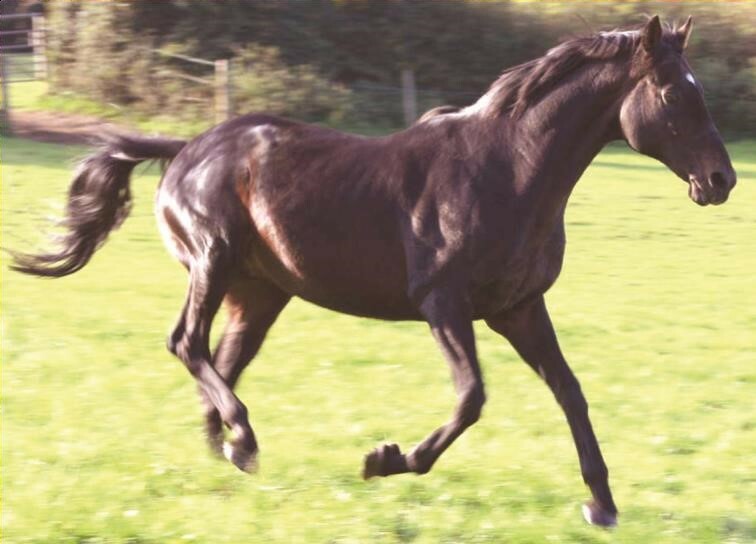 His herd fanned out behind him: half a dozen elegant, finelegged Welsh Cob mares – one with a tiny spindly little foal, another with a slightly older foal. I could hardly believe that this was Falconwood! I was in awe. He was beautiful. Falconwood came up to Terry at the gate and allowed him to rub his face and neck. There was a calm relaxation about him; although clearly in charge of his herd, Falconwood moved amongst the mares and foals with kindness. The herd stayed at the top of the field as we all leaned over the gate and Terry told us about the mares and foals; one was only three weeks old, the other three months. I needed to get closer to Falconwood, to actually touch him would bring me closer to Cayman; I needed to do that. “He’s kind in the field, provided no one tries to take any of his mares away.” I was happy to climb over the gate, but Terry opened it for me. I walked quietly into the field and meandered my way towards Falconwood, hoping that he would understand from my unthreatening approach that I had no evil intentions towards any of his herd. I stretched out my hand as I gently approached. Falconwood was unconcerned and continued grazing methodically, whilst also keeping a watchful eye on the mares and foals. When I felt the warmth of Falconwood’s muscular neck under my hand, my heart leapt. Finally – finally, I was touching the life that gave Cayman life, his foundation; how crucial that was for me. I needed a permanent record of this beautiful horse, so I set about taking photographs but, by this time, I had attracted the attention of the elder of the two foals, for whom I was very obviously a novelty. He would not leave me alone. He kept getting in the way, popping-up between me and Falconwood. He had no fear whatsoever and was insistent that I should pay him attention. Like a ‘power ball’, the more he was rebuffed, the more energy he bounced back with. I had never come across an animal like him before. Finally, I shooed him away back to his mother and resumed my photography. I concentrated on Falconwood and the clever things that my digital camera could do – I was happy that I was getting some good pictures of this magnificent horse. But then, as I was bending down, my thoughts projecting through the camera lens to Falconwood’s noble head, I was brought swiftly back to earth by gentle, repeated tugging of the bottom of my hair, which is long and was loose down my back. It felt as if someone was trying to attract my attention, but why would they be doing it like that? Then the thought that someone was playing a practical joke flashed through my mind. As I stood up and turned round, ready to remonstrate with my assailant, that it is not easy to take good photographs when your hair is being tugged, I was surprised that there was no-one there … except the insistent foal. Lisa explained that what was really funny for everyone else, watching from their vantage point by the gate, was that the foal had crept up behind me – from right across the field – with his mouth open all the way, until he got to my hair. It must have reminded him of a horse’s tail. “I do hope that my baby is not bothering you too much; but it is so nice to have a rest.” With trepidation, I dared myself to ask Terry what her name was. His response was not “Beauty”, but I was too anxious to comprehend what it was. Strangely, the second I did not hear “Beauty”, it was as if my mind shut down, although I do remember Terry telling me that she was six. I went back to Falconwood, he looked so wise and kind. I kissed him on his neck and told him that I had had one of his sons – Cayman – who was marvellous. I thanked him for Cayman. We had been looking at his herd for about an hour. Now Falconwood had decided that it was time to move off down the bank, towards the open gate in the bottom corner of the field, which led to the field from which they had come. Terry said that there was a stream at the bottom of that field; what an idyllic environment this was. The herd moved slowly and purposefully to the bottom corner and through the gate. Falconwood stood by the gate waiting until the last mare, who was slower than the rest, had gone through, then he lifted his head to look at us for a moment – before turning his back and walking through the gateway, out of view and into the next field. What an exit! I was in awe of Falconwood’s magnificence. I had to remind myself that, whilst it was Falconwood whom I had come to see, he was not the horse I was looking for. “Bonnie”, was Lisa’s reply. The insistent foal did not have a name, so I made up the name ‘Woody Baby’. He had made such an impression on me – I could not forget him. I was confused; the elements of Kia’s prediction seemed to be all mixed and muddled up. As we drove home, I tried to make sense of it all. 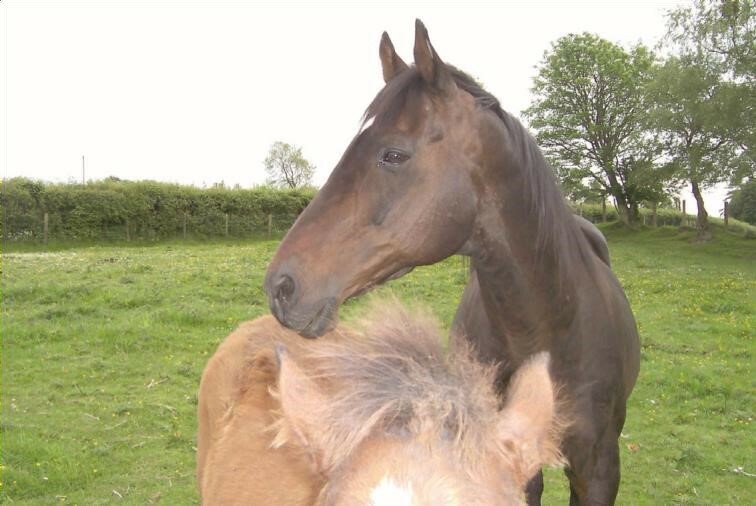 Falconwood was nearly black and he certainly had a very noticeable white star, but he was not a foal. 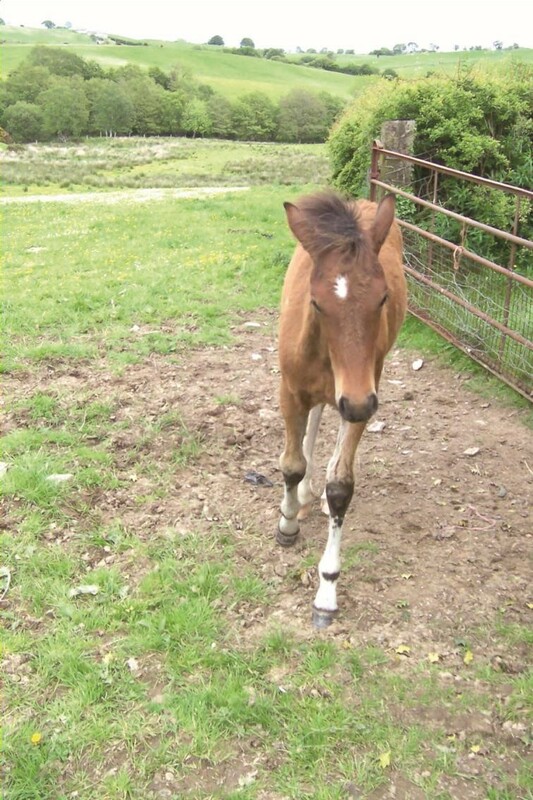 The foal, whom I could not forget, was not black – but he did look like the foal in Kia’s painting. Kia had said that when I saw Cayman, I would have “no doubt”. Now I had lots of doubts, so I decided that the foal could not be Cayman. Again, I was emotionally exhausted. The next day I telephoned Sharon to tell her that Falconwood had not looked ‘a million dollars’ – he had looked ‘two million dollars’. “Do not be restricted by it. Spiritual things are sometimes not meant to be taken so literally,” she said. “That little foal was trying to tell you something.” But what if I bought him and then the real foal appeared? Or, what if I bought him, stopped looking – and missed the real foal? Kia had said that I did ‘not have to do anything’, that Cayman would lead me to him. I was sure that Cayman had led me to Woody Baby, so why was he not black? The sequence: Robin, Robin’s friend Alex, Alex’s friend Sharon who is Falconwood’s owner, Falconwood to Woody Baby – it could not be a coincidence. So how could Woody Baby not be the right foal? It could not all be a waste of time and effort. I was covered in bruises again. In the long, mirrored wardrobe doors in the bedroom, I could see bruises from horse-bites all over my body: two on the back of my right arm, one in the middle of my chest, another on my left hip. It reminded me of the previous year, just before I had gone to Cuba, when I had had to account to a vigilant practice nurse for five bruises – all caused by Cayman. I was back to normal! CaymanHavana is a luxurious, cloth bound, hardback book (198mm x 129mm), with gold foil blocking on its spine, and a full-colour glossy dust jacket. It contains 9 original colour photographs, and has 146 printed pages, with green end papers. General. For anyone from age 10 – 110 who loves horses.